Cleansing scrubs are an important part of your healthy skin care regime. They exfoliate or remove dead skin cells, which improves the texture of your skin and allows it to retain more moisture. This in turn, enhances the efficiency of your creams, lotions and body butters. Depending on your skin type, cleansing scrubs should be used two to three times a week to keep your skin clean and healthy. Scrubs are not limited to the face; they can be used all over the body to keep skin soft and glowing. Don’t forget classic rough skin areas such as knees, heels, and elbows. When making scrubs to use on your face, grind the ingredients as finely as possible. Treat your skin with care and gently scrub in a circular motions. Here are a couple of simple skin scrubs for you to DIY at home. Whenever I ask people what their favorite cleansing scrub is, I usually get three answers; oatmeal, cornmeal, or wheat germ. Each one of these on their own are an effective simple scrub combined they create and even more effective scrub. 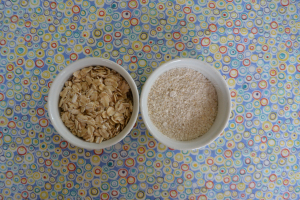 Oatmeal is cleansing and softening. Cornmeal is deep cleansing (especially helpful at removing blackheads) and wheat germ is gentle, mild and soothing to your skin. Mix all ingredients together and place in an air tight container. To use: Combine a teaspoon or two with equal parts water or cleanser to create a paste. Massage gently into your face and neck. Rinse well with warm water and pat dry. Note you can also use this scrub on your body — you will just need to use more approx 1 /2 cup. Whenever you use citrus fruits save the colored part of their peel. This is where all the essential oils are and when dried and finely ground they make an effective skin scrub. Microwave: Place the peels in a microwave safe ceramic bowl and microwave on low until dry (about 5 to 6 minutes). Allow to cool completely. Oven: Arrange the peels on a cookie sheet and place in a very low temperature oven for several hours or overnight (remember to turn the oven off when you go to bed). Food Dehydrator: Use an electric food dehydrator and follow the manufacturer’s recommendations for drying citrus peels. Now that you have your dried peels. Coarsely grind them in a food processor or clean coffee grinder. To use: Mix with a bit a water to form a paste and massage into clean skin. 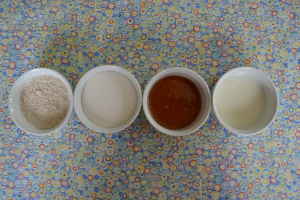 You can also combine your dried peels with other ingredients such as raw sugar, cornmeal or sea salt. Note: sea salt is too harsh and abrasive for facial skin but fine for your body just avoid sensitive skin areas. Let me know if you have any recipe requests or a favorite scrub recipe of your own! Astringents, toners, and skin fresheners are important to healthy skin because they keep your complexiabon clean and your pores clear. The cleaner the surface of your skin, the more efficient it is at absorbing and retaining moisture. Many people like to use an astringent on their faces after cleansing. They can also be used throughout the day, especially if you have oily skin. One of my favorite and free skin toner and freshener is pure, ice cold water. Splash your face with cold water after cleansing or anytime you can use a boost and your complexion will glow. It also seems to energize your whole body and spirit. This is the perfect toner for those with dry or sensitive skin. Another classic Astringent that I am sure most of you have in your bathroom right now is witch hazel. This is a product that my grandmother taught me to use and I still do to this day. Witch hazel is a plant whose bark ad leaves are made into this wonderful product. You can create your own astringents using it as a base and a few drops of essential oil or you can also add it to creams and lotions. My grandmother used it to soothe her tired eyes. She would soak cotton pads then lie down with them over closed eyes for 10 minutes each day in the afternoon. Green Tea is also an excellent toner especially helpful in healing and treating troubled or acne prone skin. This is because it contains antioxidants such as vitamins C and E, which help to strengthen your skin’s natural defenses. Simply brew up a strong cup of tea using a few bags or loose tea leaves and let cool completely. Apply the cold tea to your face with cotton and do not rinse off. Let me know what are some of your favorite ways to use astringent and toners in your daily routine? Have a beautiful day! First of all you are amazing! I think this is the year when we need to give ourselves more compliments rather than a bunch of goals and resolutions — self care is just that taking care of your self! So Happy New Year and Happy 2017! brush your teeth and floss!! I am going really try to blog more and stress less this year if it is perfect or not — as connecting is what is important plus did I say this already YOU ARE ALL AMAZING!! !